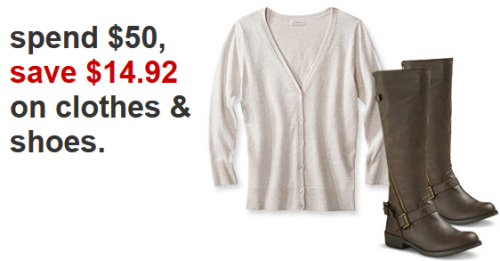 Today only at Target.com, you can save $14.92 when you spend $50 on clothing & shoes for the whole family. To get this discount, use the promo code OCEANBLUE at checkout. This discount even works on sale prices including the great buy one get one 50% off sale on women’s dresses. FREE shipping + an additional 5% if you use your REDcard, or FREE shipping on orders of $50 or more. The fine print: Spend $50 and save $14.92 on select men’s, women’s and kids’ clothing, shoes and accessories. Discount applied at checkout with valid promotion code. Offer excludes clearance, socks, underwear, Tevolio, Duluth Pack, Altuzarra and tech watches. Discount not applicable to gift wrap, tax, or shipping and handling charges. May not be applied to previous orders. Offer expires 10/13/2014 at 11:59pm PST.